We are planning for puppies! Yatzie will be mated with a beautiful Barbet dog in Avignon called Django de la Serve de la Chapelle d'Alexandre. His parents, Bolly Wolly and Coccolina, are both from Elaine Fichters kennel in France. Django was chosen as stud in hard competition with many others. The inbreeding is low and he has A-hips. Django is a bearer of old Barbet blood lines which was another important criteria. 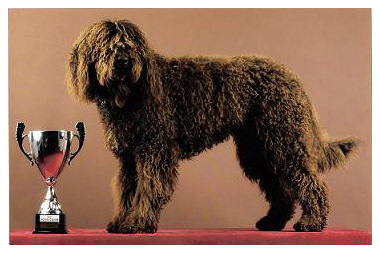 He has achieved very good results in shows and he is of course a Barbet beauty! The mating will take place in the end of November, so we are already planning all the details, leaving for France on Sunday! I have been longing for mating Yatzie for years and now finally it is going to happen. She is on heat and let us hope that love is in the air! we hope Yatzie has a very romantic time and that a nest of beautiful puppies will be the result.